Over the past few weeks, Deadpool fans have been inundated with goodies through the Merc With the Mouth's 12 Days of Deadpool campaign, which leads up to the second trailer's release on Christmas Day. The trailer will be featured during ESPN's NBA coverage, and today the cable sports network released a new promo, which features both Ryan Reynolds as Deadpool and T.J. Miller as Weasel, who offer up a holiday rhyme for the fans. We still don't know exactly what time on Christmas Day this trailer will be released, but the network is airing four different NBA games throughout the day, so stay tuned. 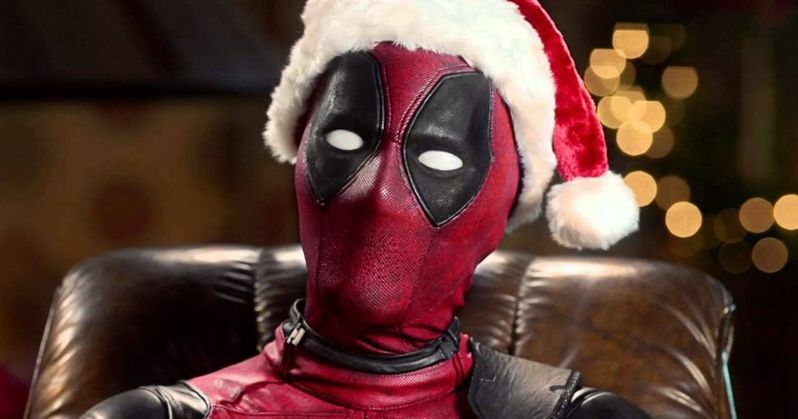 If that wasn't enough, Ryan Reynolds has debuted the latest entry in the 12 Days of Deadpool campaign, which gives fans an updated version of a holiday classic: the Yule Log. Instead of watching a loop of a burning log for hours on end, the actor has released The Pool Log, an hour-long video of a flaming bag with a hand-drawn Deadpool mask, placed on someone's front door. With just two days left until the trailer arrives, one can only guess what will be in store for fans tomorrow. Yesterday, the actor presented the IMAX trailer for the 12 Days of Deadpool, a brief 30-second video which shows what an ordinary chimichanga would look like in the IMAX format. This teaser was shown during IMAX screenings of Star Wars: The Force Awakens last weekend. 20th Century Fox is also debuting a red band trailer, but it isn't known if that will debut after the Christmas holiday. Based upon Marvel Comics' most unconventional anti-hero, Deadpool tells the origin story of former Special Forces operative turned mercenary Wade Wilson, who after being subjected to a rogue experiment that leaves him with accelerated healing powers, adopts the alter ego Deadpool. Armed with his new abilities and a dark, twisted sense of humor, Deadpool hunts down the man who nearly destroyed his life. Ryan Reynolds and T.J. Miller are joined by a supporting cast that includes Morena Baccarin, Gina Carano, Ed Skrein, Brianna Hildebrand, Olesia Shewchuk, Style Dayne, Rachel Sheen and Dan Zachary. Tim Miller makes his directorial debut with Deadpool, working from a script by Rhett Reese and Paul Wernick. Deadpool has already been confirmed as part of the X-Men movie universe, but we'll have to wait and see how/if he will show up in future X-Men movies. Deadpool hits theaters on February 12, 2016, going up against Warner Bros.' How to Be Single and another highly-anticipated sequel, Paramount's Zoolander 2. Take a look at the new promo and "Pool Log" below, along with all of the other 12 Days of Deadpool treats that have been delivered so far.